As requirements in the IT and telecom industries expand and change, maintaining a healthy and agile enterprise network is becoming an increasingly challenging task. With so many options on the market, finding a network strategy that’s right for your business and that provides proper nourishment to your operations can be less than straightforward. 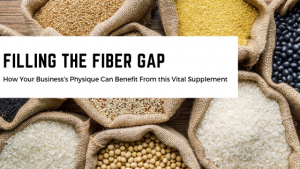 However, as your business grows, there is one key nutrient it should be utilizing: fiber. We’ve all heard that fiber promotes benefits for your body, but what about for your business? For so many organizations, a fiber-rich approach offers a host of advantages, including scalability for ensuring healthy function into the future, cost-effectiveness for keeping expenses nice and trim, heightened control and more. On the opposite end of the spectrum, a fiber deficiency can keep your business feeling sluggish with latency and downtime, resulting in harmful side effects.